Internationally renowned specialists present a comprehensive survey of the latest advances in this area. The biosynthetic and structural relationships of these compounds are summarized and newly discovered alkaloids described. Discusses versatile biomimetic procedures as well as the pharmacology and clinical applications of monoterpenoid indole alkaloids. Botanical names of all plants cited have been extensively referenced. 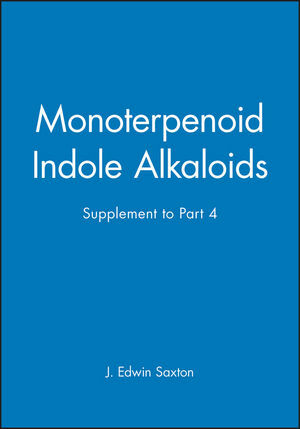 J. Edwin Saxton is the editor of Monoterpenoid Indole Alkaloids, Supplement to Part 4, Volume 25, published by Wiley. The Biosynthesis of Terpenoid Indole Alkaloids. Alkaloids Derived from Tryptamine and an Unrearranged MonoterpeneUnit. Pharmacology, Biochemistry, and Clinical Applications of theMonoterpenoid Alkaloids.